When you see that big mouth opening for you to give it some food, stop for a moment and think about what you are going to offer that waiting mouth. An important consideration in fish keeping of any type, is fish nutrition or basically what you feed your fish. Many fish will take a wide variety of food; however, many fish are also extremely specialized feeders. 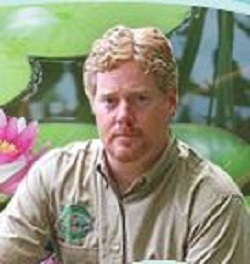 For the sake of this article we will be discussing koi, goldfish, and general pond fish food types and considerations. For most pond fish it is generally a good idea to give your fish a pelleted food, food that comes in balled form, as opposed to a flake type of food which is a flattened food similar to cereal or rolled oatmeal flakes. Pellet food is denser and packs more food into each bite for those big appetites, it is easier for portion control, and handles storage better. Most pet centers, pond specialty stores, and some garden centers will carry pond fish foods. It is very easy to find many fish food providers with a simple Google search, or look for a breeder and they will sometimes have some private label foods available to the general public. What type of nutrition is being provided with the food you offer your fish? Check the labels, just like we do for ourselves, the label will provide nutritional information like vitamin content, fat content, ingredients, and manufacture date. Make sure to get freshest food available and keep in mind most foods really do not offer any nutritional value after sitting around for 6 or more months after being opened. If your food has a bad or foul smell it should be promptly thrown out. If the food has begun to clump together it would also be a good time to toss it because most likely mold has set in. If the fish food has mold get rid of it, it is not good for the fish and should not be fed to them. Foods that have a higher fat content will generally spoil faster than low fat fish foods. Fat is good, for fish at least. A proper level of fat will give your fish energy and build up the fat reserves that are necessary for your fish to get through those winter months in colder climates. 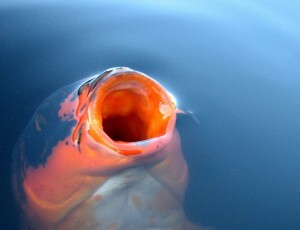 Koi store fat reserves in their head area and they burn off that fat during those months that they do not eat. A good fish food should have a high percentage of Vitamin C too, as well as other vitamin content such as A, K, D, and E. Wheat germ content is nice to have in the recipe. Vitamin C is important to a fish’s development in many ways, especially during the formative ages. Keep your fish’s food fresh, try not to freeze it and try not to let it get hot. A nice cool area, preferably protected from light degradation is the best bet. Be careful with portion control and be aware of when you need to change your food types to reflect the climate by choosing a good spring recipe, summer recipe, and fall recipe. Feed them often, and offer treats like freeze dried krill, boiled peas, and dark greens like spinach or kale from time to time…they’ll love it and it gives you a great interactions with these amazing pets.